With Amazon PPC Ad Scheduling, Sellics users can play and pause their Sponsored Product Ads at their own chosen times. 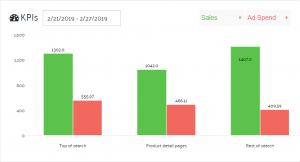 To help advertisers get the most out of Amazon’s new adjust bids by placement feature, you can now use Sellics to evaluate your placement reports, see which placement is generating the most sales, has the lowest ACoS, and much more. Winning the Buy Box on Amazon means making the sale. But there are two scenarios, where vendors might not want Amazon to win the Buy Box. Learn why! Losing the Buy Box on Amazon means losing the sale. Learn what you can do as a Vendor to not just react to losing the Buy Box, but avoid it in the future. The new Product ASIN Targeting features present interesting opportunities for advertisers on Amazon. At Sellics we’ve devised different strategies for Category, Brand, and ASIN targeting to help sellers and vendors get the most out of this new PPC targeting feature. The Amazon A9 Ranking Algorithm Update for January 2019 – What is new in keyword optimization? Amazon sellers and vendors can now optimize Product ASIN Targeting campaigns and manage their new bidding strategies directly in Sellics.